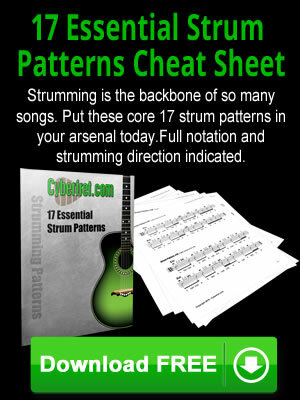 There are a couple of ways to practice guitar arpeggio forms. The first we have already talked about. Play the arpeggio starting from the lowest note, work your way to the highest, then back to the lowest. As a variation, you may want to pause on the roots in the arpeggio. That way your ear will become accustom to how all of the notes sound in relationship to the root. The roots are the gray ovals. Below is our D major arpeggio in the 2nd position that we have already looked at. Another way to practice an arpeggio is to start on the lowest root in the form, work your way to the lowest note, then up to the highest note, then return to the lowest root again. Here is that same D major arpeggio played in this way. 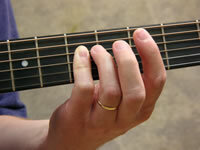 There are times when playing an arpeggio form that you will need to use the same finger for multiple strings in a row. This can be tricky at first. Below is a C major arpeggio where you need to play 3 strings in a row with your 4th finger. If you you take a closer look at my 4th finger as I play this arpeggio, you will notice a couple of things. 1. I don’t bar my finger across all three strings like this…. Barring causes all 3 of those strings to ring at the same time, and you will not have as much control over the individual notes. 2. I don’t completely lift my 4th finger off as I go from string to string. This causes some extra noise since you will hear the open strings after you lift up your 4th finger. What I do is “roll” my 4th finger from string to string. I lift up so that my 4th finger is still touching the string, and then slide to the next string without lifting my finger completely off of the previous string. There are also times when you will flaten out a finger as you play adjacent strings, but you will pivot in a way so that you are only touching one string at a time. This is best explained in the video. There are some basic guitar arpeggios that you can start to add into your vocabulary next…but unless you are really using them in your playing, it’s kind of a waste of time to practice a lot of different arpeggio forms. There is no real reason to practice all kinds of arpeggio forms unless you are actively learning how to improvise your own guitar solos, or write melodies. But if you are improvising and writing, practicing arpeggios on the guitar is going to give you a lot of important ammunition to add to your lead guitar arsenal.